The new school term has signalled the start of another new adventure for Creative Calligraphy. Having stood down from our roles as organisers of the Inspire Network meetings in South Tyneside, Lynsey Rollins and I are now co-hosting Colleagues on Tap co-working events. We held our first one on Wednesday, September 5 – the day after most children headed back to class. It was a great opportunity to catch up after the summer holidays, but also to plan ahead. With that in mind, we discussed our plans for the rest of 2018 in our ‘spot chat’ and Lynsey came up with an impressive goal-setting reward chart. 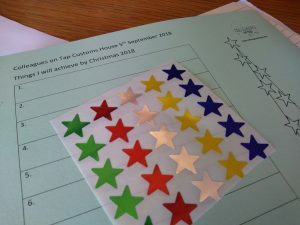 Between now and the next meeting, our task is to come up with a list of things we want to achieve before the end of the year and write them down on the Christmas tree chart. As each one is achieved, you get to add a bauble (star sticker) to your chart. It’s certainly got me thinking about the next three months, especially after what’s been a busy year so far. I’ll let you know how I get on with the list, but it was interesting that many of us at the meeting were looking to recharge our batteries and get a bit of work/life balance back. Maybe the kids didn’t drive us crazy enough during the holidays! What would you like to see from Creative Calligraphy as 2018 draws to a close and we enter 2019? Please leave a comment below. Colleagues on Tap co-working days were launched in 2010 to support entrepreneurs, freelancers and remote workers in the north east who may struggle working from home, or crave the social interaction of the office environment. Director Jo Cameron explains: “Colleagues on Tap co-working days help you get surrounded with colleagues for a day, so that working for yourself no longer means working by yourself. “The facilitated events allow you to carry on with the day job, but with the added advantage of office banter – only without the politics! “Co-working days are friendly, fun and informal, but also hugely productive and informative. “It is a great opportunity to connect with other local business owners or homeworkers while you work, so you don’t need to take time out of your daily routine to attend networking events. Lynsey is chartered architect with her own practice, L Rollins Design, which she set up 10 years ago. She has regularly attended Colleagues on Tap co-working days, whereas I’m a newcomer that couldn’t be more impressed with the set-up and support on offer. 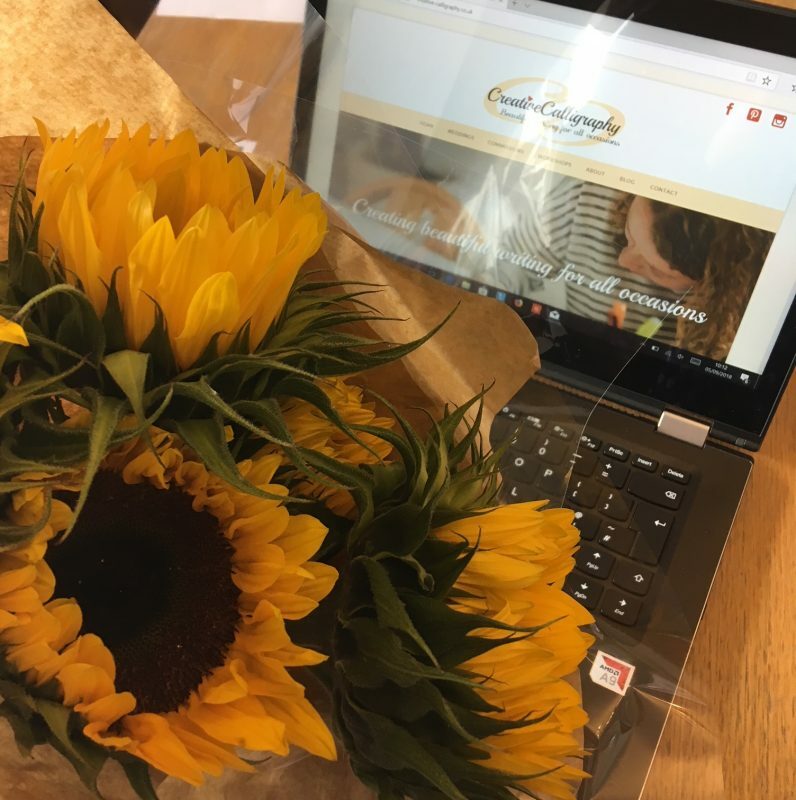 Jo turned up on our first day as hosts with a beautiful bunch of sunflowers and a good luck card for each of us. Our next co-working day is on Wednesday, October 3, from 9am to 5pm, at The Customs House in South Shields. The cost is £20, which includes lunch, workspace, Wi-Fi and refreshments. You can book up to join us here and check for future dates too. Colleagues on Tap co-working days also take place in Newcastle, Sunderland, Durham, Darlington, Blyth and Consett. To find out more, visit the website here. Angela is based in South Shields, just outside Newcastle upon Tyne, but is happy to accept commissions from anywhere in the world.